Its nearly the first official day of Spring, just as we say goodbye to the last of the CSA Winter Shares for the season! We hope you have enjoyed participating in our Winter Share…it was a bountiful winter of greens and storage crops, even though we hit a few bumps in the road with potatoes and carrots. We appreciate your support throughout the winter and hope that you were able to create lots of delicious meals to share with friends and family during the cold, rainy months. Although the winter has a smaller palette of local crops that are available than during the summer months, it still boasts a really wonderful and nutritious set of offerings and we’re glad you decided to continue to support your local farmers! The farm is looking very verdant and cheery as the longer days and warmer temperatures coax everything out of their winter slumber. Bees can be found foraging in the flowering mustards, the Oregon Maples are beginning to blossom, and the fields smell sweet with the scent of mustard and fava blossoms. We are racing to get as much accomplished as we can during this window of good weather so we can create space in the fields for our very first rounds of transplants to go outside- head lettuce, kales, fennel, onions, broccoli, napa cabbages and beneficial flowers. Transplanting season always comes as a bit of a surprise, since it feels like we just wrapped up the last of the field work not so long ago. Our muscles also have to re-learn the many hours of bending over and walking that come along with this time of year as well, but we look forward to it for sure! Cabbage: The cabbage is quite pale this time around- because its more like the heart of the cabbage than the whole thing. These cabbages braved the winter elements out in the fields and still have nice, tasty leaves underneath their haggard exterior. Those tough outer leaves sure did their jobs though- because once you peel away enough of the outside, you are left with a nice little head of cabbage. Chard: This chard has been the gift that keeps on giving. This is the very same chard that we planted back in July last year and harvested throughout the late summer and fall. Once the rain and cold temperatures showed up, the chard went to sleep for the winter. Normally thats the end of it…but this season it awoke from its slumber rather than disintegrate in the cold. I think the stems are probably the best tasting chard stems I have ever had! Kale: This mix is similar to ones we have done in the past with Red Russian, White Russian, and Rainbow Lacinato. This time we added in a little Winterbor for some ruffled texture. Kohlrabi: This is another storage superstar for sure…we grow two large varieties that have been bred specifically for storage. As such, they have tough (and lets be totally honest…kind of weird looking skins) that are oftentimes mottled with some black or grey. For the best continued quality, stash your kohlrabi in a plastic bag and cut off however much you want to use at a time and peel right before use. We just got a great tip from a new staff member to try out kohlrabi pancakes!!! Just grate the kohlrabi and mix in some egg, bread crumbs, and seasoning of choice, then fry little pancakes until golden brown on both sides. She tops hers with a parsley-yogurt-avocado sauce. Wow! Leeks: They just keep getting bigger and bigger…will they ever stop?!?!? One of my favorite decadent treats (which I have made for St. Paddys Day in the past and goes great with soda bread and taters) is to bake them in heavy cream with a dash of nutmeg and salt. Cut the white portion in half, put in a dish cut side up so they are touching but not crammed, and fill the pan until they are very nearly submerged. Cover with foil and bake at 375, remove the foil after about 30 min and then continue to bake until the cream looks thickened to your liking. Sometimes I put it under the broiler just a bit at the end. Purple Sprouting Broccoli: This was a nice little treat from an experimental planting we did in one of our greenhouses. We planted the broccoli a little late, but then put some of the plants in the greenhouse to see if we couldn’t hurry things along a bit. We’re glad we did, because it was ready just in time for the last share! Rather than a singular large crown like regular broccoli, purple sprouting broccoli is a massive plant that sends out tons of long, slender side shoots with little mini florets on the tips and sometimes along the length of the stem as well. The stem is really sweet and tender so you can eat the whole thing along with any leaves that are attached. Cook it gently and quickly like you would asparagus- if you let it languish in the pan or overcook the shoots, it will rapidly turn mushy and flavorless. Saute it quickly and plate it right away…dress it with some salt and olive oil, lemon and garlic, or tamari, rice vinegar, and sesame seeds. Radish, Daikon: The crisp texture of a radish is always a treat this time of year since many of the other crops available are more of a starchy root. You can cut them into rings and lacto-ferment them, grate them for salad, or use for slaw. Cooking daikon is a common practice, although I can never quite bring myself to cook a radish. The ends and tips suffered some insect damage, so those have been trimmed away. Some we had to trim quite a bit, so it may look more like a daikon log than the whole root. Tastes great though! Also make sure to store these in a plastic bag so they do not loose that crisp texture and turn rubbery. Winter Squash, Crown Pumpkin: This squash has got to be one of the absolute best storing we have ever seen! Long after all of the other squash have faded, or begin to turn into something resembling a science-experiment, Crown Pumpkin is still going strong! The ash-blue and peach colored exterior is very tough, so be prepared to use some muscle power to cut these open. The flesh is a nice deep orange and tastes great! Enjoy & we hope to continue to grow for you this summer! 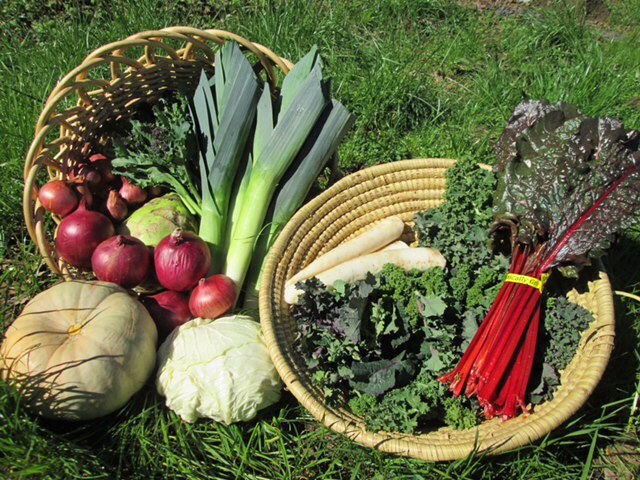 Sign up is now open for our May-November CSA season.